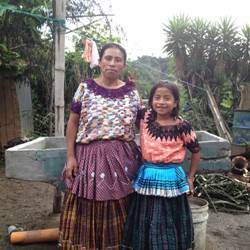 The Oasis Keeping Families Together initiative is regarded as one of the more innovative programs in Guatemala, and the Oasis team often trains other organizations in implementing similar ministries. Since its beginning, nearly 50% of our Oasis girls have been reintegrated into their family – nuclear or extended. Our primary goal is to reconcile and reunite an Oasis girl with her family and then provide the support needed for success. Even though some of the girls return to live with their families, they often still need our help. “Keeping Families Together” focuses on healing through the power of the Gospel so relationships can be restored, discipleship can continue, and the girls don’t feel like we have abandoned them. Oasis KFT’s team provides education support, micro-businesses, and family discipleship that seeks to break generations of dysfunction and allow a girl to thrive in her own family. For he has not ignored or belittled the suffering of the needy. He has not turned his back on them, but has listened to their cries for help. (Psalm 22:24). Support the Ministry of Oasis Keeping Families Together with Your Gift Today.